If you have programmed a game, nowadays it's one the most difficult tasks to make this finally public. The earlier one is working on it, the better the success rate. But before you sacrifice a lot of money and effort for its "advertising" one should initially use a few other channels - Social networks! 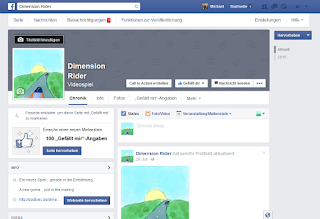 Because I care about this blog to accompany the development of dimension Rider, it is appropriate to create corresponding representative pages on Facebook and other networks on an early stage. Theoretically, you can never start too early, unless you want certain strategic advertising effects. - A web space or homepage hosters service must be present. - If necessary, you have to have the appropriate programming skills. - Since this is different for each hoster, I will not go into detail. A counter-example (not commercially viable and not ad-free, if you want it for free) would be eg http://de.jimdo.com - can easily and quickly be clicked together without any further knowledge. - A Facebook Account must exist and be logged in. - The top right -> click on the small arrow to open the menu. - Click the "page" button. - Now you can select one "main"-categoery (brand or product). - And then the actual category (video game). 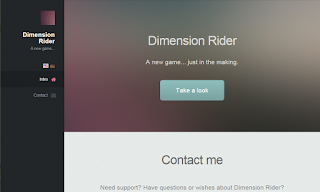 - And the desired name (Dimension Rider). - Now a profile picture can be uploaded. - Then there is the possibility to add that page to your own favorites. - Recently, a target group can be set. Prerequisite: - A Google+ account must exist and be logged in. - On the Google+ page https://plus.google.com at the top left click "Overview". 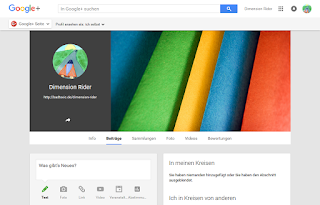 - Creating a new page via "Google+ create page" button. - Select a category (brand: product). - Fill in the form (Dimension Rider, http://badtoxic.de/dimension-rider, product or brand). - Now can anything be adjusted ... ready! Prerequisite: - A twitter account must exist and be logged in. 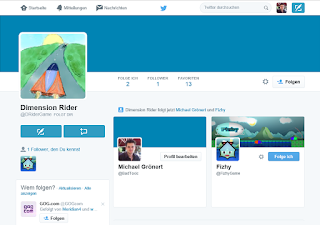 - The data is then confirmed and a username specified (DRiderGame). - Now you can provide a phone number (skip). - and get contacts suggestions. by clicking the link in the confirmation email just received. So, these should be the main contact points for potential community members. Creating these is one thing, but it regularly to maintain and fill with people is another. I'll leave it for a start like that. The first post in these communities will be a reference to this blog or directly to this article.